On March 13, 2012, the sun erupted with an M7.9-class flare that peaked at 1:41 p.m. EDT. This flare was from the same active region, No. 1429, that has been producing flares and coronal mass ejections all week. That region has been moving across the face of the sun since March 2, and will soon rotate out of Earth view. 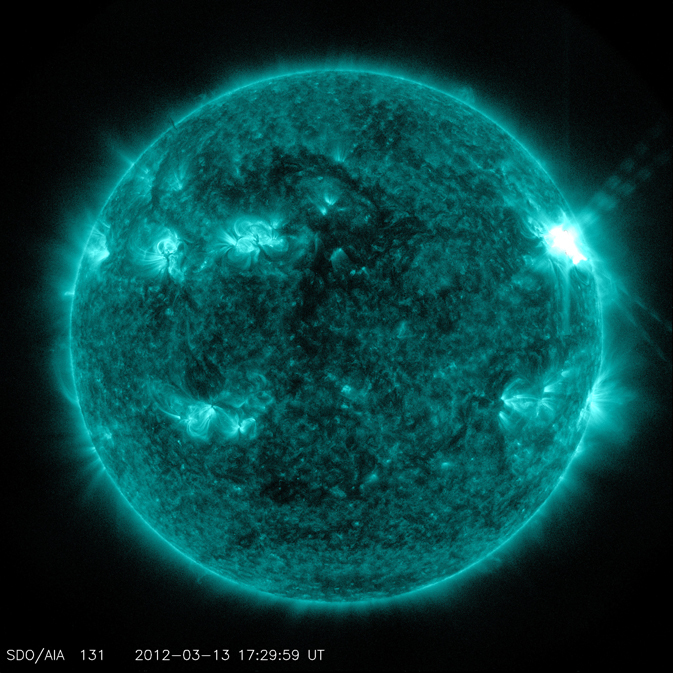 NASA’s Solar Dynamics Observatory (SDO) captured this image of an M7.9 class flare on March 13, 2012 at 1:29 p.m.EDT. It is shown here in the 131 Angstrom wavelength, a wavelength particularly good for seeing solar flares and a wavelength that is typically colorized in teal (Credits: NASA/SDO).